Priya R. Kothapalli, Moritz C. Wyler von Ballmoos, Kavya Sinha, Ponraj Chinnadurai, Alan B. Lumsden, Mahesh K. Ramchandani. OBJECTIVE: Pseudoaneurysms of the ascending aorta usually occur at anastomotic suture lines or cannulation sites. Risk factors include chronic hypertension and aortic calcification. The standard treatment for symptomatic and enlarging pseudoaneurysms is surgery. 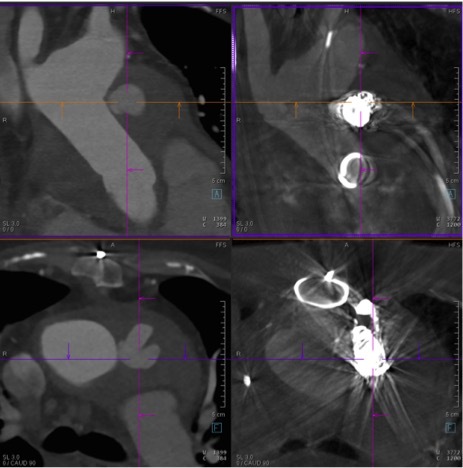 The purpose of this case report is to demonstrate a percutaneous approach using advanced image-fusion for the treatment of a pseudoaneurysm in a frail patient with recent heart surgery. METHODS: 77-year-old female with a history of hypertension and a thoracic ascending aortic aneurysm. The aneurysm (4.8cm) was initially discovered during routine work-up; on follow up multidetector computed-tomography angiography (MDCTA) chest 6 months later the ascending aorta was measured at 5.1cm. The patient underwent an uneventful valve-sparing aortic root procedure (David-V) and ascending aorta replacement. She was discharged on postoperative day 7. A month later she experienced a syncopal episode; on admission, a MDCTA chest showed a mediastinal hematoma and a pseudoaneurysm arising from early anastomotic suture leak at the distal suture line. The patient was not a candidate for reoperation due to frailty. Given the location of the aneurysm, a covered stent was not an option and trans-arterial embolization was attempted. The small neck of the pseudoaneurysm could not be engaged by this route. A repeat MDCTA scan 3 days later showed substantial enlargement of the pseudoaneurysm. With advanced imaging technology using 3-dimensional fusion of MDCTA, intraprocedural cone-beam CT, and fluoroscopy, we performed a successful percutaneous coil embolization of the pseudoaneurysm. CONCLUSIONS: We present a detailed, step-by-step description of how to plan and perform a complex percutaneous coil embolization. Here it was used to coil an ascending aortic pseudoaneurysm and avoid a redo-sternotomy in a frail patient. This technology, using 3D-fusion of multiple imaging modalities and image-guidance allows for percutaneous interventions on targets previously considered too high risk.